The "flying classroom" was yesterday - long live the "digital classroom"! The Intel Atom platform makes possible a large number of mobile devices for specific application areas. For this reason, particularly in the realms of education, new concepts like the "digital classroom" are realised better than before. We have closely inspected the Convertible Classmate PC from Unimall as a representative of this new generation of teaching aids. "Let us strike the right path for the future of our children and inform you of the possibilities of the "digital classroom" and future-oriented education" were the words of Olaf Kleinschmidt ("Germany's most IT-literate teacher") in his official statement on unimall.de. For notebookcheck.net this is reason enough to look more closely at the current technology developments in the realm of the education system. 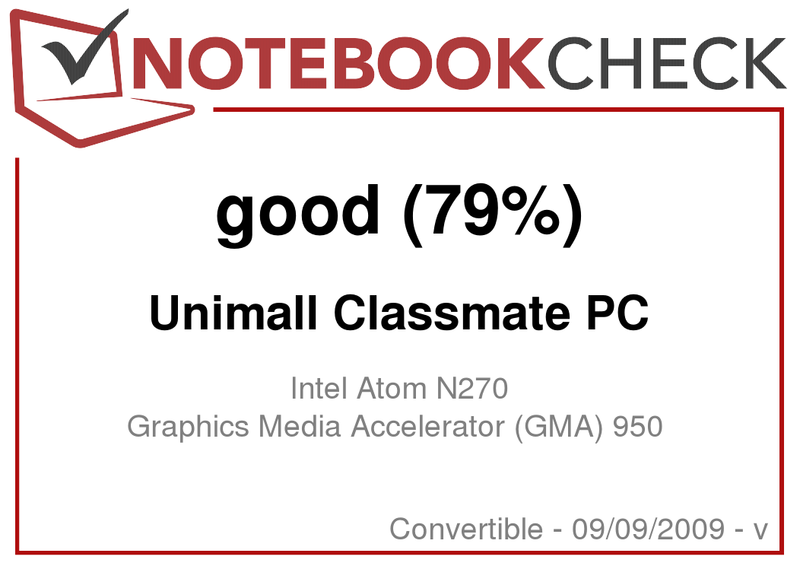 Today the focus is on the Unimall Convertible Classmate PC - a tablet netbook for children from 12 years on the basis of Intel Atom processors. The Classmate PC is a compact companion with dimensions of 240 mm (W) and 180 mm (D), whose weight of 1.34kg barely has any effect in everyday life. The display size of 8.9" is still acceptable for the device's size, yet the small keyboard keys pose a clear challenge to adults when it comes to touch-typing. Here you can quite clearly see that the Classmate PC is made for kids! And this is also recognisable in many other places on the device. The bright case makes a very solid impression. The hard plastic deployed allows for no kind of distortions on the case, and the display lid barely gives way under a large amount of pressure. The plastic really feels pleasant and also seems insusceptible to scratches - an important characteristic for the target user. The display sits still in its mounting. This guarantees marginal rocking when adjusting the angle of the lid. This is also essential, as the hinge also has to hold the display closed, as Unimall didn't design the netbook to have a closing latch mechanism. When you think about it, this is a particularly poor solution, as the Classmate PC will, for example, be transported in a school satchel. Here the slit of around 3-4mm means it is possible that materials could easily penetrate and damage the display. What's worse is that this slit is not only on the case front, but is also clearly visible on the right and left. Or, the netbook could completely open when it's not in a normal position, as the retaining function of the hinge is very weak. At least a magnetic latch would have been wise, if you had wanted to avoid additional hook and eye systems. Surprisingly high-value tablet PCs like the Dell Latitude XT convertible tablet PC also don't possess a closing mechanism. Similarly a "clamshell design", would have been preferable, like for example that of IBM/Lenovo office devices which has long been standard. In this kind of design the display sits rather recessed in the notebook lid, so that it closes without a gap with the underside or is even slightly enclosed by it. In this construction the integrated spacers would have been better suited between the display and keyboard: these are currently on the right and left border of the keyboard and are sometimes cumbersome when using the device. Why the, until now, solid concept of a children's PC wasn't consistently thought out isn't known. The 6-cell battery sticks out on the rear of the device and is angled downwards. Thus the netbook stands higher at the back than it does at the front. What we found very pleasing - the flexible handle with a name tag on the rear. This can be permanently detached after removing four small screws. A simple mechanism for this is unfortunately not provided. The Classmate PC offers an USB connection on both the right and left side of the case. On the right-hand side you'll find network-, microphone- and headphone-connections as well as the opening for the stylus. On the left-hand side the VGA output as well as the SD card reader are fitted. On the rear side there's merely the power supply and an opening for a Kensington Lock. For this reason the variety of connections is rather exhausted - in fact anything more would not have had enough room without mutually disturbing the connected devices. For connections to networks the netbook has 100 MBit Ethernet LAN and WLAN 802.11b/g/n. Firewire, Bluetooth, infrared or slots for upgrade cards are not present. On our test model, which is loaded with Windows XP Home, is to be found quite a bit of useful additional software: first of all we have a very practical network manager. With this tool you can make profiles for different network configurations. Furthermore a software snippet is installed for the webcam. As the Classmate PC can also be used as a tablet PC, for this there is also the suitable character recognition software complete with fitting office applications at hand (MyScript Stylus 3.0, SMART Notebook 10, Windows Journal). Thus handwritten text can also be digitised. Alternatively the tablet version of Windows XP could have been used, because in that a very good handwriting-recognition is already integrated. However, Microsoft has already discontinued distribution of this Windows version. Last but not least the icon of backup software blinks in the taskbar. Unimall describes this range of software as "Intel software stack consisting of ... anti-theft software, memory- and access management, touchpad optimisation and collaborations software." The Classmate PC can be purchased with or without an operating system. In doing so there's the choice between the Linux system Ubuntu Netbook Remix and Windows XP Home. The device is supplied with a power supply, battery, operating system CD and a manual. Unimall offers a 15 month guarantee - the repair service is, however, currently removed. Data can be input via the standard keyboard and touchpad or the touchscreen. The attack of the keys is pleasant and the stroke is surprisingly large for the small device. However as already mentioned, the keys are very small and really only suited for kid's fingers. On the other hand the splash-proof protection for the keyboard is very useful for the target user. Due to the low dimensions of the device, the keyboard features a few peculiarities: for example, the keys "home" and "end" are lacking. 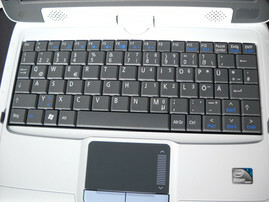 The keys "page up/down" are placed on the arrow keys as dual-function keys, likewise several additional characters are only reachable via "Fn" configurations. The rest of the special keys are to be found in the F-key row. For input via the touchscreen at best you will use the supplied stylus, which is always within reach on the front of the netbook. Alternatively your finger can be used – however then selecting small icons in applications becomes rather difficult. The sensitivity of the 5-wire touchscreen is, however, not outstanding and requires a relatively high amount of pressure on the display. Writing on the display is as a result simplified and is also difficult since the wrists cannot be put on the display. When it comes to the built-in, 180° rotatable 1.3 Megapixel webcam, kids will really get excited. However, as expected, the camera does not provide usable frame rates. Straight away it's a positive story: no reflective display. What turn out to be unergonomically graded displays in such a device would absolutely be out of place, as this could have negative effects on the development of eyes that are still growing. The resolution of the well illuminated display is 1024 x 600 pixels with an average display brightness of 158 cd/m². The black value is absolutely all right for an office netbook at 1.14. The stability of the viewing angles guarantees that a bunch of children can see everything clearly in front of the device and even from the sides. In 3D applications, depending on the scene, the fine grid of the touch-sensitive display can be noticed. The maximum brightness can be forcibly regulated when running from the battery. The illumination drops away slightly at the borders, yet this is only noticeable on a rather white display and in normal circumstances doesn't stand out. Also use outside is possible, as long the sun doesn't shine directly onto the display. For a kid's netbook, the setting of new benchmark records obviously does not stand in centre stage. Thus the technical data implies solid office performance in an environment where mechanical stability is also important. Unimall provided us with the Classmate PC with an Intel Atom N270 processor (1.6 GHz) and an Intel 945GSE chipset with integrated graphics. Together with 1 GByte of main memory and a 16 GByte SSD as a hard disk it should make for brisk work. Wlan and 100 MBit Ethernet are obligatorily on board. However, an optical drive is lacking. Indeed it is possible to execute simple 3D applications with low detail settings with the GMA 950 graphics chip - however nothing more. The 16 GByte SSD as a hard disk proves to be extremely wise. This gets along without mechanical components and is thus protected completely from shocks and any resulting damage to the data medium. Furthermore the handling speed is even higher than on conventional hard disks for netbooks, which often work at a lower rpm (4200 - 5400 rpm). The fact that the SSD only has 16 Gbyte of memory is indeed not much on first look, yet for its intended use it is more than enough. In everyday life the Classmate PC fulfils the expectations when it comes to operating speed - office and internet applications run really fluently and also the handwriting recognition works without disturbing lag. At low loads the classmate PC behaves relatively quietly at 33.6 dB(A). The inaudible SSD and the non-existent optical drive also contribute to this. Under full load, however, the netbook reaches a high value of up to 41.1 dB(A). However in normal use you will rarely reach the maximum value. Somewhat more critical is the development of temperatures. Above all kids can react in a more susceptible way to heated surfaces and can feel that working with the device is unpleasant if the device temperatures are too high. When idle no kind of abnormalities are on the device, whilst it remains as cool as expected on the upper side - max. 34.9 degrees Celsius is indeed no great result, but acceptable. The underside warmed up to 40.2 degrees Celsius – that can even be unpleasant, if the device is positioned on the thighs. Under load these values get even worse: 39.4 degrees on the upper side and up to 45.2 degrees Celsius on the underside are decidedly too much for use in the hand of kids and astonishes due to the deployed Atom hardware. Other manufacturers prove that it can be better. (±) The maximum temperature on the upper side is 40.1 °C / 104 F, compared to the average of 35.4 °C / 96 F, ranging from 21.8 to 55.7 °C for the class Convertible. (±) In idle usage, the average temperature for the upper side is 32.8 °C / 91 F, compared to the device average of 30.3 °C / 87 F.
(-) The palmrests and touchpad can get very hot to the touch with a maximum of 40.1 °C / 104.2 F.
(-) The average temperature of the palmrest area of similar devices was 29 °C / 84.2 F (-11.1 °C / -20 F). The speakers that are built into the Classmate PC in the lower border of the display sound clear and surprisingly loud. However basses and middles are lacking - but of course this is no wonder. For the target user it is more important that, for example, wordings for learning a foreign language sound loud and clear, instead of playing back bass-heavy music. This is fulfilled by the speakers adequately. The energy consumption varies between 8.8 Watt when saving the maximum amount of energy (minimum brightness, energy-saving profile, addition devices off...) and 18.3 Watt under full load (maximum brightness, high-performance profile, additional devices on, benchmark...). In normal use the device should use between 10 and 15 watt. Under load we reached a running time of 3 hours and 25 minutes. In "Reader’s Test" (maximum battery life) the netbook ran well for 6 hours and 13 minutes before it turned off. For the long battery life, clever power management was in use (which turns off unnecessary components like WLAN if required, or defines the maximum brightness of the display) alongside the deployed, energy-saving hardware among other things. The power pack turns out to be pleasantly small. The Unimall Classmate PC is thought-out and robust for small kid's hands. Unnecessary equipment (optical drive, interfaces) is done without in favour of functionality (touchscreen). The good ergonomics is only limited by the high temperature development. Given the offered processing power you could describe the Convertible Classmate PC as a small "hothead". However this is acting on the assumption that the computer will be mostly under a small load in everyday school life and consequently nevertheless keeps a cool head. A wise range of software completes the good impression of the device. Currently there are no further accessories for the Classmate PC, but according to Unimall they are underway. The Classmate PC is available in Germany and the English-speaking realm (with English keyboard) from 289.00 € without an operating system. The Linux variant costs just about 10 € more, for Windows a total of 359.00 € is necessary. The tablet netbook is amongst other things also available from Wortmann as the Terra Mobile 08EDU-III and from Tarox in the form of the Basic Book 100. In the English-speaking realm it is also known as the Intel Classmate PC. 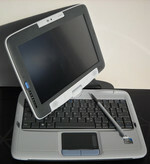 How much you will use the features of this tablet netbook must eventually be decided by the user. After this first and foremost the purchase advice applies: the features should only be used in connection with further hard- and software and its networking to the full extent. Resulting costs should therefore absolutely be thought of. As a paper- and pen-replacement the Classmate PC is certainly not advisable - the touchscreen is too small and imprecise. However good hardware alone still doesn't make a "digital classroom" like Unimall and Olaf Kleinschmidt have been publicizing. The well thought-out and wise learning concepts are just as important, without which a pupil's PC is basically worthless. The very action-taking, like that which is currently to be observed in many schools, misses the mark of bring children closer to sensible exposure to IT at an early stage. That this is important in the time of modern, IT-based businesses and should be learnt at an early stage is out of the question. However the current notion of so many "education experts" is often to be questioned. At this point we would thus recommend the words of Herrn Kleinschmidt warmly to accountable education authorities: "let us pursue the right path for the future of our children together". We'll keep that in mind. ... and can be turned into a tablet PC. ... but doesn't allow quick plugging in and unplugging. Another look in the hinge of the display. ... also from the side. 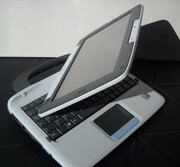 Traditional netbook and tablet PC in one device. Very robust. Matte display. A latching device for the display. In our opinion the hinge alone does not suffice. That, in order to use the touchscreen, you've got to muster up a lot of energy. Extensive writing on the display is so not fun. 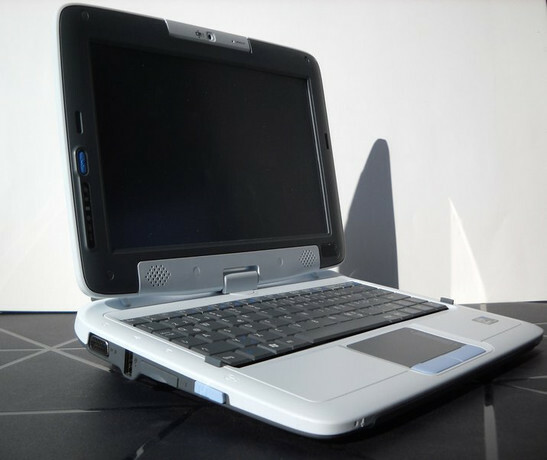 The netbook is offered by Wortmann and Tarox in a similar configuration and at similar prices.